COME SKI THE ROCKIES...THE SNOW'S A COMIN'!! The ski and snowboard season is here and so it is time to look into that ski pass that will suit your ski-needs and your wallet! You have a number of ski resorts to choose from and all have their advantages. Location may play a role in your decision as will price. Think about when you want to go skiing. Do you want to go primarily on weekends like everyone else or are mid-week days a possibility; a time when you can avoid the ski-rush!? Do you want easy access to the resort closest to you or are you willing to drive to different resorts and experience the new hills and different snow? These are just a few things you may want to consider before you make the big (end expensive) decision of thee season's pass. Come enjoy Canada's largest single ski resort! 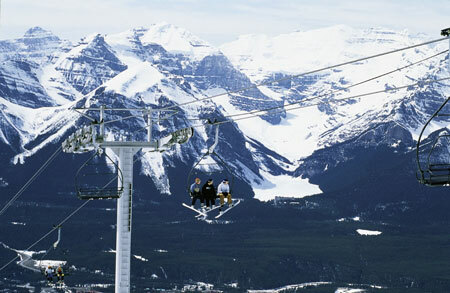 Read some fun accounts of the ski-adventures that await you here in the Canadian Rockies! Click on Ski Stories to wet your appetite! Just click to take a look at the different resorts that await you! LOOKIN' TO SKI THE Big3™? Here are the prices for various passes if you want to ski the Big3™: Ski Banff @ Norquay, Sunshine Village and Lake Louise! The 3 ski areas of Ski Banff @ Norquay, Sunshine Village, Lake Louise feature more than 240 runs on over 7,700 acres of skiable terrain. Each has a unique character and the three are available on one convenient interchangeable lift ticket which is good at all 3 resorts.